Ayeina is an award winning site, run by two amazingly talented sisters whose work has been featured all over the world. 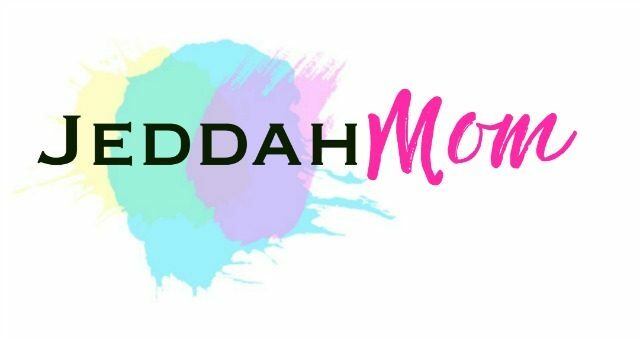 They created #AlhamdulillahForSeries after their hugely successful Instagram series by the same name. The book is already very popular and the hashtag even more. They recently had a #GratitudeCaptionContest and a #GratitudeArtContest around the same series. The book is soon to be translated into Arabic, Urdu, German, French and more languages. Last year, my kids had done the A-ZofAkhlaaq Series during Ramadan. Although we didn’t get a chance to fully journal our entire adventure online, we did complete all the letters and enjoyed learning together as a family. I was wondering what I could do equally exciting for the blessed month this year when, as if God had answered my prayers, one of the Ayeina sisters sent me this book. 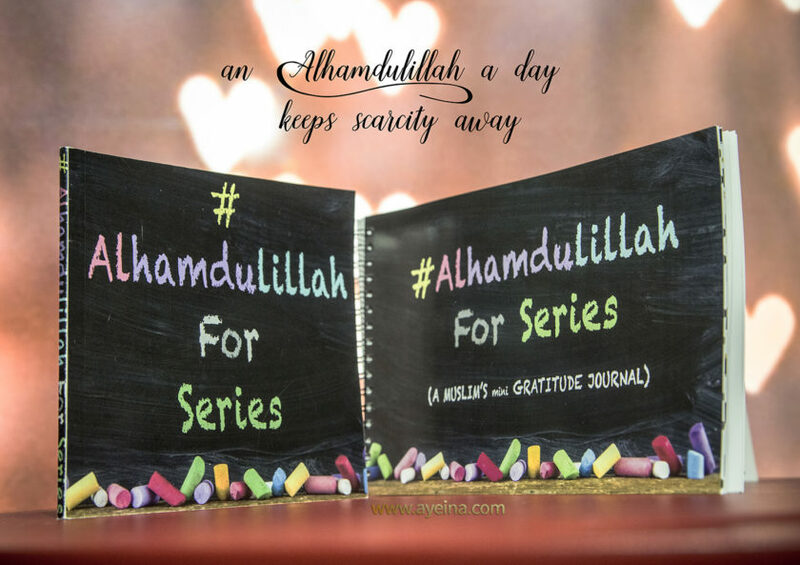 #AlhamdulillahForSeries is really an amazing journal! It has 46 pages of beautiful water painted graphics, ayahs from the Quran, mini reminders and journal sheets to jot down my thoughts. 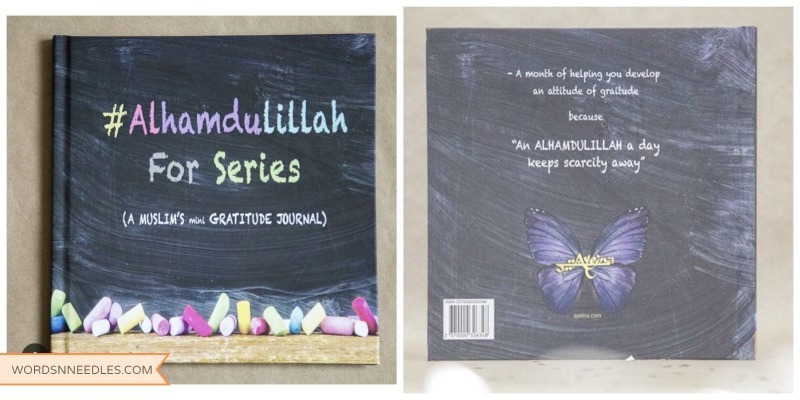 The #AlhamdulillahForSeries journal is a four week course to help you and your children ‘develop an attitude of gratitude’. When I introduced the journal to my children, they were amazed by the drawings and the simple reminders which even my almost four year old could understand. My youngest (2 and a half year old) enjoyed pointing at the pictures on the pages while we talked about the topic of Gratitude. In the book, each week is divided into themes and then followed by a page to list your blessings each day. I selected some of the pages and printed them to be put up on our theme board as a reminder. Every day, between Iftaar and Isha’a, we sat down together as a family to reflect on what things we could add to show gratitude for. I found that #AlhamdulillahForSeries is a very good conversation starter. I have been able to talk to my children on topics that I never thought I could get out of them. These were moments when I got a chance to peep into their minds. I saw how deeply kids, so young as they are, can think. My husband saw the book too. He was full of admiration for the work by the Ayeina sisters as well. Since it was early morning and the kids were asleep, we had a good discussion on the various topics in the books too. I noticed while reviewing the book with him that this journal can be very beneficial for couples as well. I am sure that while doing the month long course, they can find more reasons to be thankful for the blessings in their lives. As I said earlier, it is an excellent conversation starter and that goes for between couples too. Ever since I saw #AlhamdulillahForSeries, I have been thinking about all the ways this book can be beneficial to my readers. I have been thinking about who would need it, how can the young mothers who read my blog use it in their lives and what they can extract of value from it to enrich their lives. That says it all. Everything that we are is because of the blessings of our Lord. Mothering isn’t easy. We face hardships in keeping our homes, taking care of our children, performing our duties as a mother, wife and daughter. But.. there is joy too. There is nothing more rewarding than bringing up our children. This journal, I felt, is that ‘journal of happiness’. We can record our joys and thank God for them by writing in these beautiful pages. Even when the day hasn’t gone well, I know while searching myself for atleast one reason to say #Alhamdulillahfor will make me sleep well. That one line of #AlhamdulillahFor will be not just my gratitude but my prayer to my Lord as well, asking Him to bless me even more with what he has given me. Teach Children Responsibility through Gratitude: While I was doing the course with my children, I saw how it was helping my children feel the responsibility upon them. When they saw the prompt ‘Alhamdulillah for home cooked meal’, I was able to tell them about the people in the world who had no choice but to eat outside or takeaways. My husband was able to chip in to tell them how, for years when he didn’t have me and was living away from his mum, he struggled with cooking and had to eat outside. He told them how sick it made him feel (*me beaming no doubt*) and how he gained so much weight. When they saw the prompt ‘Alhamdulillah for access to education’, I was able to tell my children about the kids who have to work, rather than study, because they have no money. We were able to talk about their responsibility as our children and ways to give thanks to their mom for making the food and their dad for sending them to school. For fathers to connect with their children. This journal is for fathers too. I am going to start my husband on with this after Ramadan, inshaAllah. My husband already has a tradition of reading to the children and talking about the day at bedtime; but I believe this journal can help them look at their relationship and thank God for the individuals that they are. Most fathers that I know are always finding faults in their children. Also, most children don’t really connect with their dads the way they connect with their moms. I am talking about older children aged 8 and above here. This journal can help them bond together while doing the month long course. For mothers to connect with the kids. Sometimes, there are issues in parenting. Challenges that arise that make us unable to connect with our child. Usually when kids are older in their preteen or teen age, there are issues like peer pressure, bullying, identity crisis, etc where in mothers feel totally at loss. As I was saying earlier, this journal can be used to initiate conversations. Usually, kids talk about what they can relate to. When I asked my son (8yrs old) what he was thankful for at the moment, he said, ‘I am thankful for good neighbours to play with.’ I knew how he had been struggling all through the school year with finding good friends and how he came home angry that his school-mates were not like him. He had written in his diary about how sad he was and wanting to move schools. When he told me about being happy playing with the neighbours, I didn’t need to pry further to ask the details. If you have older children, try this with them. 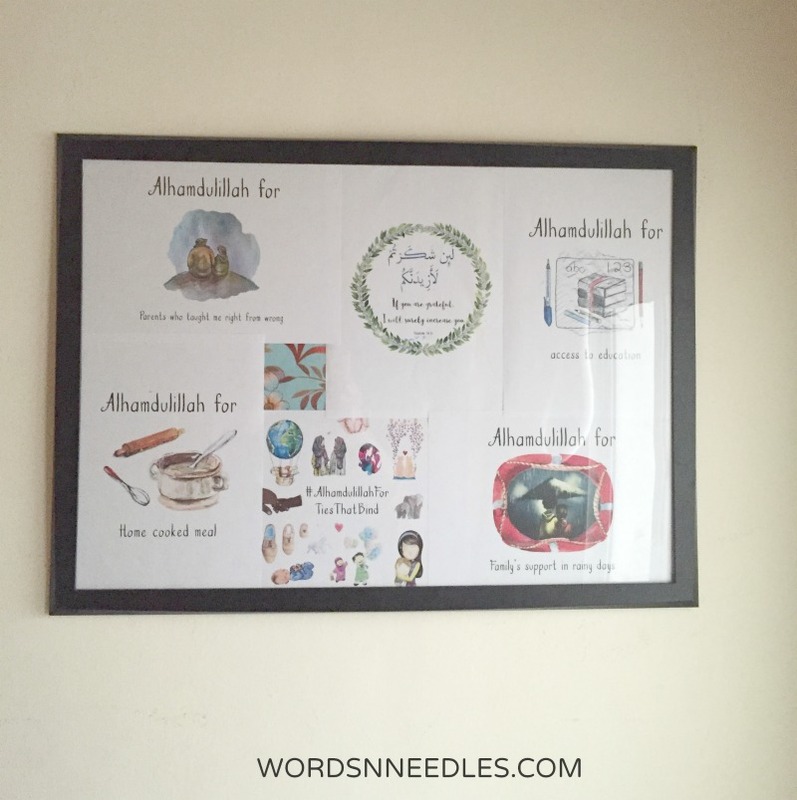 Mother and child activity prompts. You all know how I love to craft with my children. 🙂 This journal can help you with setting a theme for those activities and crafts to do. Pick a week and write down seven things that you are thankful for and then devise or find an activity based on it. You have one whole month of themes right there in that book! These are just some of the ideas. I am sure you can find more ways to use this book if you look into it. This book is an excellent gift for Eid by the way. 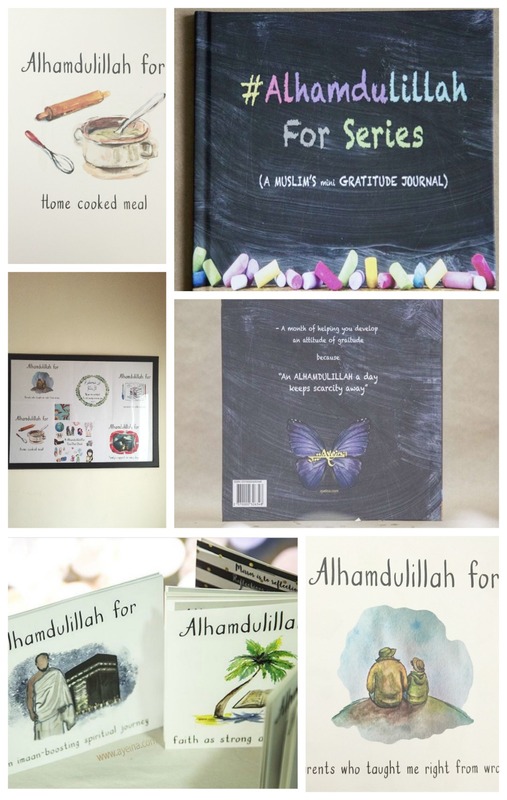 Where to find #AlhamdulillahForSeries Gratitude Journal? This book, is available as a PDF instant download, a softcover paperback as well as a hard cover notebook. You can download it instantly from the Ayeina.Com website or if you like, you can order it on Amazon. Order the PDF version here. Order the Hardcover on Amazon below (affiliate link) or hop on to Ayeina Store to avail a 25% discount on the 8×8″ hardcover for Eid plus free international shipping. Soft cover 6×6″ is also at discounted rate for Eid. Available here with free shipping to Pakistan only. I hope you benefit from the #AlhamdulillahForSeries as much as we did. Tell me in the comments: how do you teach gratitude to your children. It touched probably every blue and red vein of the heart. Jazakillah khair. We are beyond honored to have you review this. The pleasure is all ours. Definitely. Aww… Thanks. Pleasure is all mine. I am really honored to be working with you guys too. We are really loving our journal and I hope others can see how many different ways they can use it.